From the very rough dutch translation the title reads something like Pathology from the Physician or Physician’s Pathology. Furthur translating Psyche’s songs titles reveals a litany of similar themed words such as “Insane,” “Bestial,” “Mercury (? 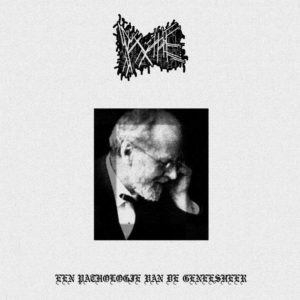 )” and “Cranial.” I am not here to hack my way through Dutch translations rather put into context the debut full length from Psyche, a one metal black metal act that seems to use a variety of different projects for various voices. Psyche’s voice is also the one that sounds like hellish screams inside an abandoned asylum. Aside from the medical themes and metal health motifs which stalk around this record, Psyche’s segments the blistering black / death with moments of guitar solos, soundclips, and a general entertaining approach to something that is rather abysmal on paper. The vocals are something unique and almost entirely inhuman throughout its running time. Despite this however, Een pathologie van de geneesheer never becomes repellent as Pscyhe has found a way to make the collapse of mental structures under the chaos of bestial screams quit pleasing to listen to.